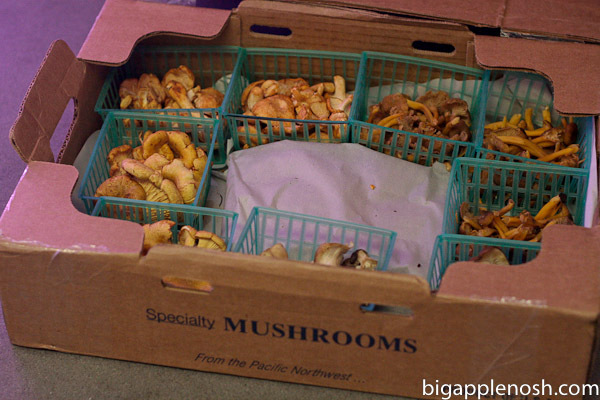 I received four different types of mushrooms, each with a distinct flavor, texture and aroma. These little guys were so cute that I couldn’t help but do a little fungi photoshoot. 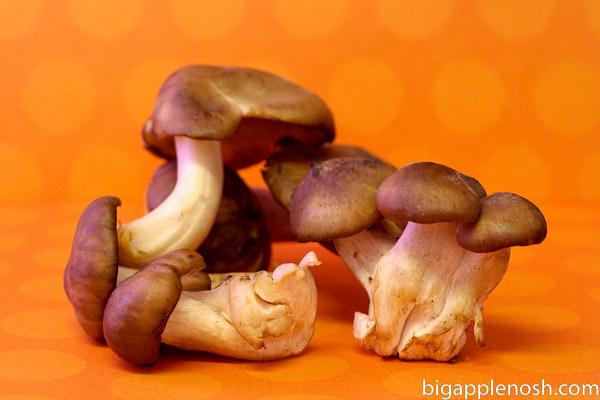 I’ve also included a brief description of each mushroom type, info courtesy of Marx Foods. 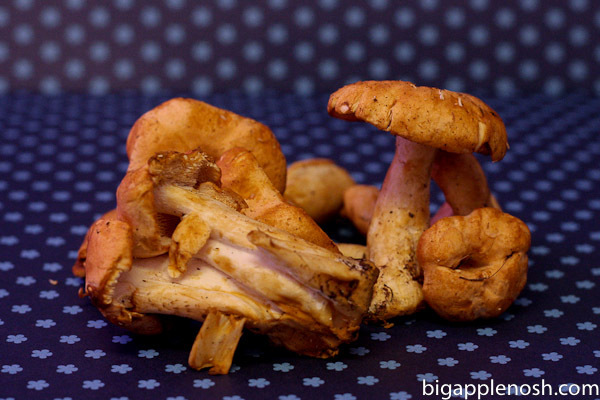 These first mushrooms, below, are Fried Chicken mushrooms. I know, funny, right? Fried Chickens Fried offer an adaptable, mild flavor and a firm texture, and they can be subbed in for Shiitake or Oyster mushrooms in recipes. Next, on the striped blue background, are the prized Chanterelles. With a earthy and fruity aroma, Chanterelles are sturdy enough to hold their own when sautéed with butter or paired with other dairy. These delicate looking fellas on the red background are Yellowfoot Mushrooms. 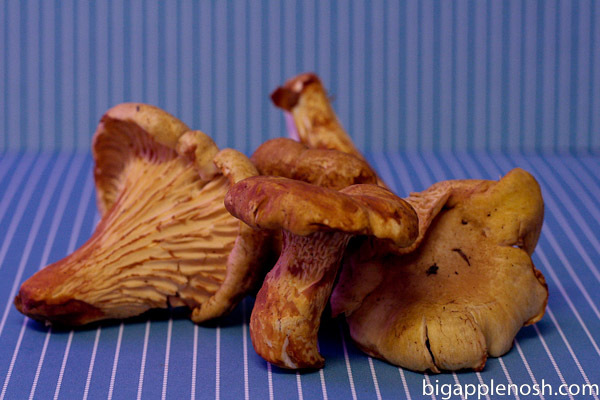 With a delicate flavor matching its delicate stem and cap, yellowfoot mushrooms are extremely versatile. Finally, in the very first picture (dark blue background), we have the Hedgehog Mushroom. The hedgehog gets is name from the small “teeth” it has under the cap in place of the usual gills. 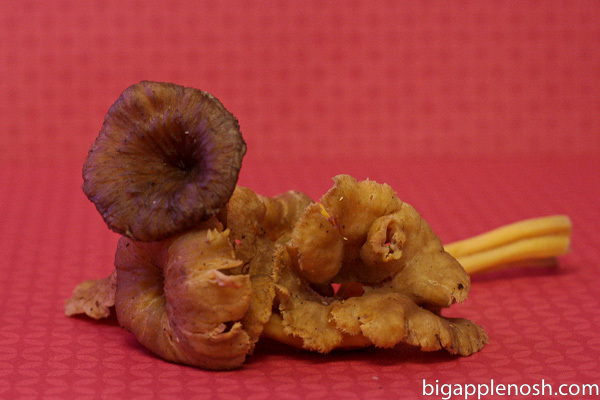 Hedgehogs are rich, buttery and is thought to be related to the chanterelle. I’m not going to lie, with a little (ok a lot) of help from my friends, I consumed ALL the mushrooms in this first shipment. Want to know how I prepared all these mycological delights? Stay tuned! What’s your favorite mushroom dish? Wow. I wouldn't even know what to do with all those mushrooms. Yum! Love mushrooms so much, and those all look amazing! How fun to get to try all of these! I can't wait to see what you do with them! Fun! Is that weird that I think a mushroom tasting would be fun? Can't wait to see what you came up with! can't wait to see what you did with them! they look so delicious. Chanterelles are my favorite! can't wait to see what you made with them!